We began first with equipping the kitchen and talking a lot. This week we started the actual preparation of pastries, following technique, learning gestures, positions, economy of movement, doing things in order. We did several wonderful things with the lovely butter but my absolute favorite was this one. In French, it is called La Religieuse, which means "the Nun". I believe this might be a sign that I must look to the nun within and exercise self-restraint in the coming months as we bake together through the program. But aren't they beautiful? 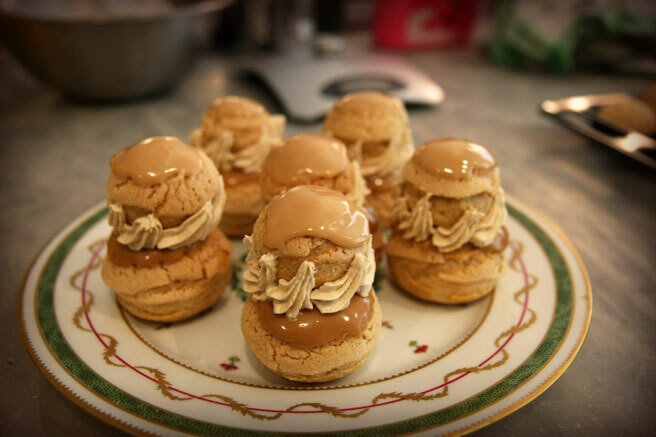 They're choux pastry with a crackly dough on top to make them puff up nice and round, filled with flavored creme patissiere, topped with flavored fondant, stacked, and graced with flavored buttercream. We prepared all of these here in the kitchen. These were coffee flavor. You know, me and my pastry coach. You'll hear more about her. Just beautiful and impressive too! I must say , our nuns at school didn't look like these. These look positively sinful ! Ooooh...I want to know how to make this! Can I just say how lucky I feel to be able to learn from you directly. This class was AMAZING, and the pastries were phenomenal. I think we laughed pretty much the entire time, such a joy! AAaand, your photos are unbelievably gorgeous! bisous!